The New York Times bestselling author of the Oprah Book Club Pick Cane River brings us the evocative story of a once-enslaved man who buys his freedom after serving as a translator during the American Indian Wars, and his granddaughter, who sustains his legacy of courage.Cow Tom, born into slavery in Alabama in 1810 and sold to a Creek Indian chief before his tenth birthday, possessed an extraordinary gift: the ability to master languages. As the new country developed westward, and Indians, settlers, and blacks came into constant contact, Cow Tom became a key translator for his Creek master and was hired out to US military generals. His talent earned him money—but would it also grant him freedom? And what would become of him and his family in the aftermath of the Civil War and the Indian Removal westward?Cow Tom’s legacy lives on—especially in the courageous spirit of his granddaughter Rose. She rises to leadership of the family as they struggle against political and societal hostility intent on keeping blacks and Indians oppressed. 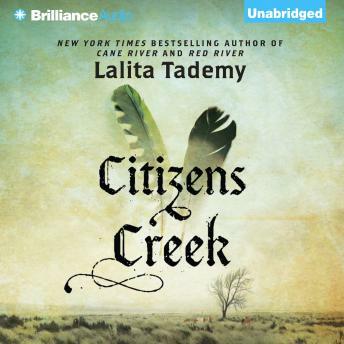 But through it all, her grandfather’s indelible mark of courage inspires her—in mind, in spirit, and in a family legacy that never dies.Written in two parts portraying the parallel lives of Cow Tom and Rose, Citizens Creek is a beautifully rendered novel that takes the listener deep into a little known chapter of American history. It is a breathtaking tale of identity, community, family—and above all, the power of an individual’s will to make a difference.